This is a tuxedo jacket that I bought at a thrift shop on Valencia St. ($17 for a Dior jacket that fit perfectly!) I ran WS2811 strips along the seams so as to take advantage of the natural lines of the jacket. They are wired together on the inside. The first strip terminates right at the bottom of the jacket and has three wires running up the inside to the front pocket. In the pocket is the battery pack (4 Lithium AAs) and an Arduino Pro Micro. The Arduino controls the lights with the Adafruit Neopixel library. I put a toggle switch between the batteries and the Arduino so I could plug it into a USB port for programming while still running the light strips off the batteries. This is the first program I wrote for it, and I’m pretty happy. I’m really excited that I can easily program dozens of patterns and also add sensors to it (motion, sound, light/color, etc.) Expect to see more videos of the jacket in the future. I got my Yun a few days ago, delivered at work. When I got home I figured I had about an hour to play with it before I had to go meet some people for drinks. I already had soldered this colorful shield and was familiar with the Neopixel libraries so I had an option for display. I was most interested in setting it up to read some information from the web via wifi and having it change the colors on the shield to reflect some kind of updates. The Yun comes preloaded with libraries for Temboo, which saves a lot of coding on the Linux side, and just lets you write regular Arduino sketches. 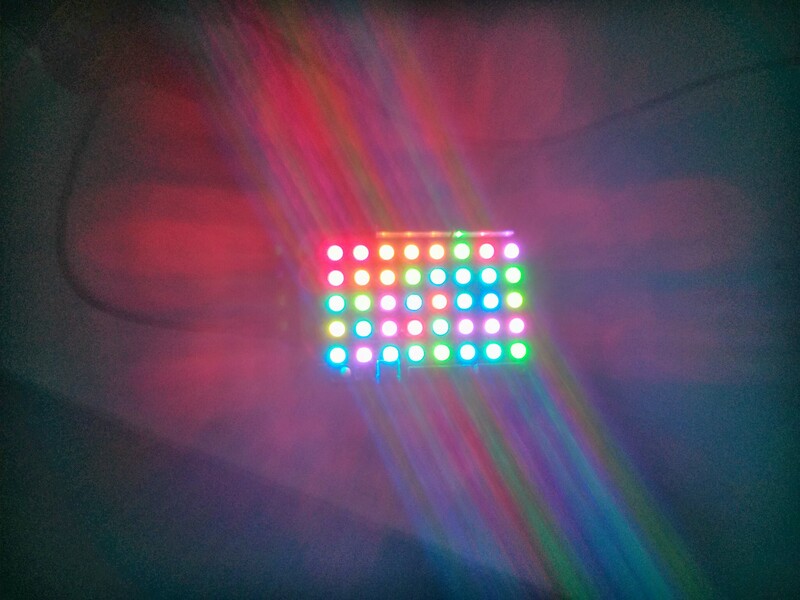 They had an example for Twitter, so I decided to go with that and see if I could show my Twitter feed as a sequence of colors on the Neopixels. Only fill one of the variables no matter how many you retrieve. I created a loop which fills in the filters the way Temboo expects them though. The next problem I had was although I was trying to retrieve 40 tweets (the number of lights on the shield), I was only getting 7 back. It took me a while to understand why, but then it occurred to me — the ATMega was running out of RAM. Since I’d never actually tried text processing on a microprocessor this small before, I hadn’t expected this. So I removed the line that retrieved the tweets and just retrieved the author names. This allowed me to get about 15-20 results, but still not enough to fill all my pixels. As a guess, I assumed that Temboo was able to get all the results (the Linux side having a lot more RAM), but they got packaged and sent to the Arduino which didn’t have enough RAM to handle it. To work around this, I kept the count at 40 but ran the request 4 times and had a different set of output filters each time (the first 10, the second 10, etc.). And it worked! If you have questions about the code, put them in the comments so I can answer them for everyone! For New Years 2013, my friend Steve Davis organized a big party in Geyserville at a very strange venue with lots of Ocelots. I had an old HL1606 light strip that I’d bought from Adafruit so I thought it might be interesting to make something for the party. I particularly like how easy it is to see the different frequencies hit. Also, it’s really bright. As always, it’s hard to film LEDs at full brightness, but this definitely lights up the room. I brought this to a dance party, which people really enjoyed, and where I was referred to as an “artist” for the first time. I experimented with other shapes, which I don’t have videos of. The Christmas lights and the MSGEQ7 ended up being pretty cool tools that I was able to use in a lot of later projects. I have a lot of hobbies and enjoy experimenting with electronics, food, cocktails, party concepts, chemistry and physical feats. Sometimes people tell me I should write this stuff down. I was never very good at blogging, but I’m trying again. My self-hosted WordPress installation fell into disrepair and I didn’t have the patience to fix it. I tried using Google+ but it’s not really expressive enough for long posts.